We are now at the half way mark of Leg 1 of the Oyster World Rally – that fact alone is so hard to comprehend. 2 years in the planning and the execution is speeding by at a rate of knots! This is by no means a permanent holiday…just a different way of life- vocation not vacation! The days begin and end the same way when not on passage. I still wake up to a cup of tea and James fastidiously cuts up half a grapefruit (known in French Polynesia as a pamplemousse) and a selection of available fruits to throw over his muesli, accompanied by Greek yoghurt. Every night we climb into bed exhausted by the physical stresses of the day which can be anything from polishing the copious amounts of stainless steel around the top sides, stringing up a washing line to hang out the smalls, scrubbing floors in the heads, or keeping on top of all the cleaning on and under deck. Maintenance is a daily task. Hygiene is also so important on a boat – if someone gets sick it transfers very quickly in such a close environment and the spread of infection is a constant problem! Just on our boat alone we have had to deal with a bursitis (on the elbow), a seriously infected foot, a nasty infection in a toe nail and a tropical ulcer – nothing heals quickly in the constant heat! Needless to say the antibiotics are being chewed through. Our off work time is used to the max! In Tahiti we drove to the end of the only road to visit the “Big Wave” at Teahupoo, a Mecca for surfers from all over the world! A series of water taxis of varying shapes and sizes take onlookers out to the watch the surfers contest some huge waves which end up diluted as they reach the shallow reef…the power of nature in its purest form! We trekked into a rich verdant valley in the centre of the island with a guide who underplayed the trek! It encompassed walking, climbing, swimming, jumping, diving and dragging ourselves along to reach a magical Tahitian waterfall of such scenic beauty that it was worth all the bruises and sweat laden smelly clothing. We sailed to Moorea, a short distance away and kayaked and snorkelled to see huge rays and sharks circling, drove around the island in a 2 seater 2 wheel drive that was so difficult to keep on the road that James said it reminded him of “the Brute”, an old touring bus that he and Christopher ran in Tasmania in the early years of the Camping Connection. With our friends the Fluters (a delightful English family of 5) we completed another trek high up into the peak areas of the island in pouring rain and mud….and whenever and wherever we can, we scuba dive. In the what seems limited time we have each day we try to see and do as much as we can possibly fit in, not knowing if or when we will return. 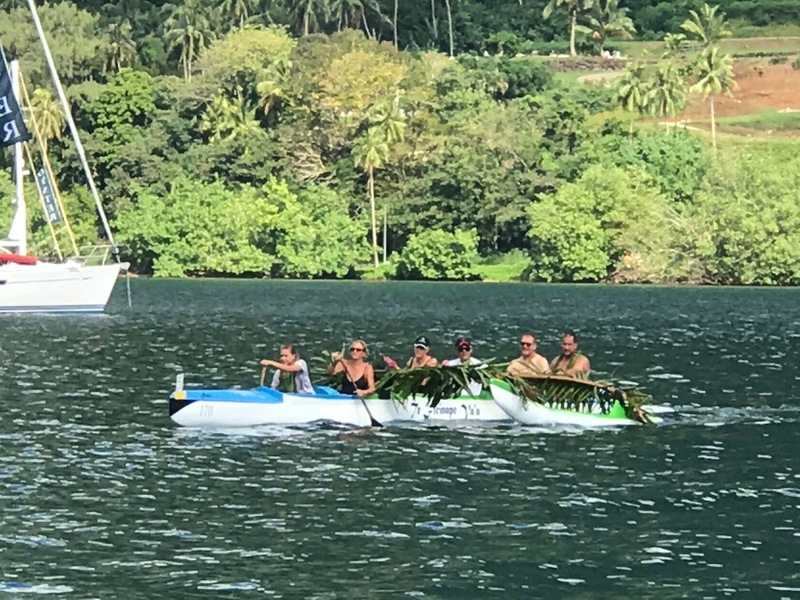 Back to Papeete to collect the Steffos (John & Claire) and Maryann Kirk, our crew from Papeete up to Huahine was complete. James and I had managed the marina moorings alone perfectly until our departure with guests onboard! Unfortunately our anchor had another thrown over it and so when we tried to exit we were being held by tons of weight pinning us to the spot. John jumped into the tender to wrestle with the chain but no luck…we were finally assisted by a dinghy of Marina crew and a lone onlooker from another Oyster. 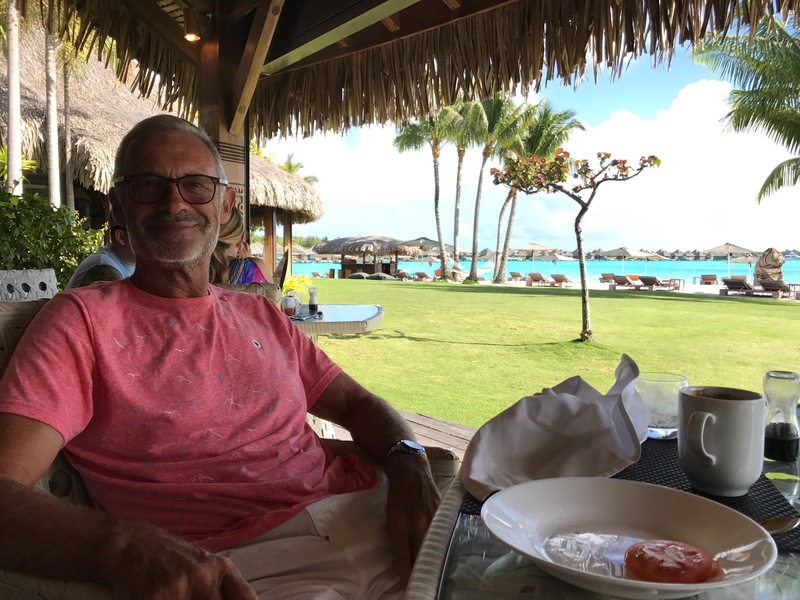 A mid afternoon arrival back in Moorea and an invitation to a 4th of July part on board two of the American Oysters was the beginning of a very social week. On our sail over I had been training the girls on names, boats and everything OWR so that they didn’t feel overwhelmed. Imagine the surprise of the fleet when Mare and Claire did not only know their names but their boat and crew names as well…so very impressive!! 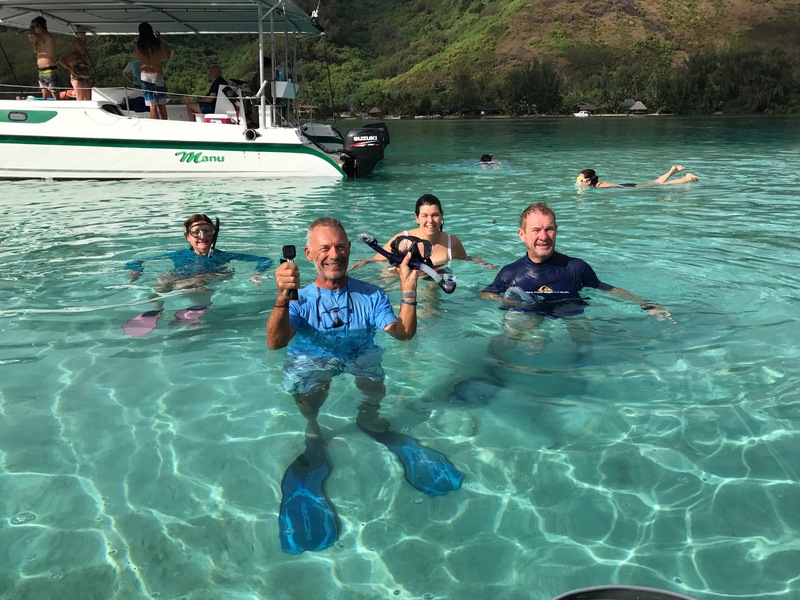 Our stop in Moorea included drinks and dinners with the collective Oysters, snorkelling with huge rays and reef sharks, a quad bike tour of the pineapple plantation and surrounding deep green gorges…. Huahine is idyllic…a place to go to get away from the tourism traps of some of the better known of the Society Islands. Heavily wooded and set inside a protective lagoon similar to the Tuamotos, it is easy to see why the early explorers were captivated by the way of life and beautiful people. We helped to celebrate the 30th wedding anniversary of Jacek and Dobra on “Shanties” in true Polynesian style with a Polish cocktail or two thrown in! As the wonderful week with our friends drew quickly to an end and they flew back to Papeete we pulled up anchor and headed to Raiatea for some boat servicing and to pick up Rachel. Our longest hike to “the plateau” on Raiatea – 6 hours and 55 minutes climbing 640 metres was to view the endangered floral emblem of the islands. A kayak trip, Indiana Jones like, included a visit to a fruit and vegetable farm owned by a local called Andre, who proudly wielded his machete around to donate bananas, coconut milk, some weird fruit that appeared out of the inside of a gnarly beat like pod, bread fruit and misshapen cucumbers to our states for 6 pack of beer. Sadly in the beautiful bay in which we were anchored a number of Oysters had gear pinched from their tenders at night – an anchor, a baler, we lost 2.5 pairs of thongs (yes 5 in total) and a foiled attempt at 4am to remove a fishing rod. Tahaa, just north of Raiatea revealed a gem of a restaurant in which we dined a couple of times complete with French Chef Bruno, some fabulous snorkelling and a local rum distillery to top it off. We are nearing the end of our stay in French Polynesia and while James and I luxuriate for a couple of days in the St Regis Bora Bora for his birthday, Rachel is preparing the boat for the next leg to Tonga. A few more days of Tahitian hospitality, wonderful French patisseries and supermarkets then across the International Date Line to take us even closer to our destination, Australia.